Alan L. Bean walked on the moon during the Apollo 12 mission and commanded the second Skylab flight, spending 59 days aboard the orbiting laboratory. He was born March 15, 1932, in Wheeler, Tex. He received a Bachelor of Science degree in aeronautical engineering from the University of Texas in 1955. At Texas he was a Navy ROTC student and was commissioned upon graduation. After completing flight training, Bean was assigned to a jet attack squadron at the Naval Air Station in Jacksonville, FL. After a four-year tour, he attended the Navy Test Pilot School and flew as a test pilot for several types of Navy aircraft. He was one of 14 selected by NASA in the third group of astronauts in October 1963. He served as backup crewman for the Gemini 10 and Apollo 9 missions before assignment as Lunar Module pilot for Apollo 12. On November 19, 1969, Commander Pete Conrad and Bean landed on the Ocean of Storms and became the third and fourth humans to walk on the moon, while Richard Gordon orbited overhead in the Command Module. During two outside excursions they deployed several surface experiments and installed the first nuclear-powered generator station on the moon to provide the power source. They inspected an unmanned Surveyor spacecraft that landed there two years earlier and collected 60 pounds of rocks and lunar soil for scientists to study back on Earth. On July 28, 1973, Commander Bean, Jack Lousma and Dr. Owen K. Garriott became the second crew to inhabit the Skylab space station. During the 59-day, 24.4 million-mile flight, they accumulated 1,200 pounds of experiment data, including 12,000 photographs and 18 miles of computer tape gathered during surveys of Earth’s resources and 76,000 photos of the sun to help scientists better understand how it affects the entire solar system. Bean retired from the Navy in 1975 but continued with NASA as head of the Astronaut Candidate Operations and Training Group. He retired from NASA in 1981 and since then has devoted his time to creating paintings which serve as an artistic record of Apollo and of humankind’s first exploration of other worlds. He works out of his studio in Houston. 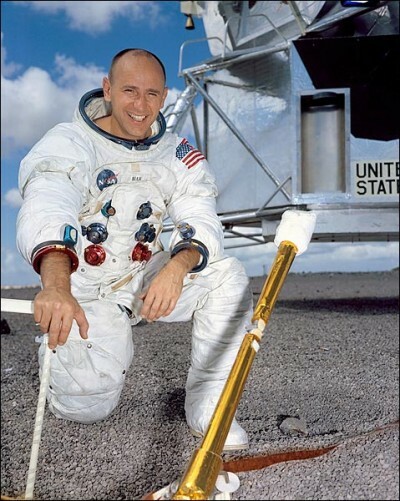 Alan Bean was inducted into the U.S. Astronaut Hall of Fame on October 4, 1997.